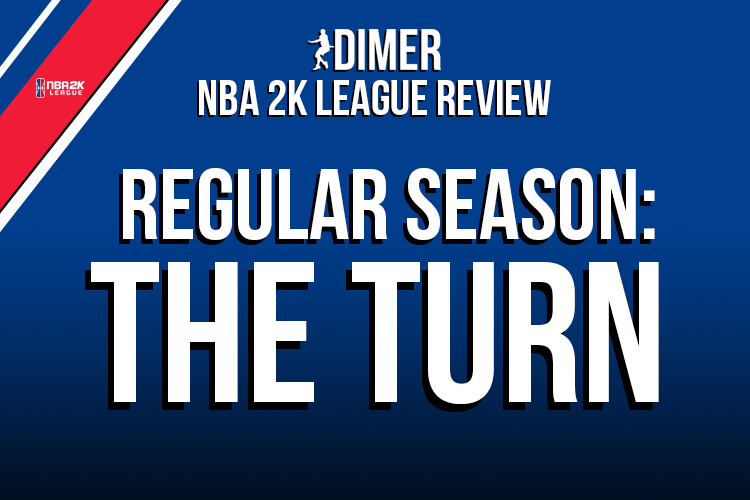 Welcome back to the DIMER Review! You may have noticed that there was little content last week, including a lack of week four review or THE TURN preview. I was a little busier than usual last week due to various events and didn’t have the time to write anything thoughtful or in-depth about the league. But, I’m back, and I have thoughts again about the NBA 2K League. Here are five takeaways from THE TURN, with power rankings to follow. After spending five weeks using the traditional broadcast camera for NBA 2K League games, the league decided to switch things up for THE TURN and use the popular 2K Camera for the entire tournament. Admittedly, I used to be staunchly in the broadcast camera camp, and my initial reaction to the 2K Cam was lukewarm at best. As the games went on, though, I found myself warming up to the 2K Cam. I think my initial hesitation when it came to 2K Cam was just me associating it with Pro-Am streams and 5-Out (nobody wants to watch 5-Out). But I’m not exactly ready to demand a full-on switch to the 2K Cam for league games yet. When I talked about the broadcast camera in my TIPOFF review, I mentioned how refreshing it looked. The same could possibly be said here, where I might just enjoy the 2K Cam because it’s new and a break from the norm. I think the idea of rotating between the two cameras is a decent compromise between the 2K players in their comfort with the 2K Cam and the league wanting to display its sponsors and not potentially scare off casual viewers. With wins of 10, 16, 22 and 14 points throughout THE TURN, Blazer5 sits on the NBA 2K League throne. It’s easy to argue that their strength of schedule during this tournament wasn’t the strongest. The right side of THE TURN bracket looked much more difficult going in than the left side that Blazer5 was on, and indeed it proved to be a bloodbath with some of the league’s best teams duking it out. But in a league where consistency is possibly the most desirable trait when it comes to team performance, there is no team more consistent than Blazer5 Gaming. Every win in this league is a good win, especially when you don’t allow any opponent to get within single-digits of you by the end. Mama Im Dat Man scored 30 points or more in the final three games and was deservedly handed tournament MVP. The rest of the cast did exactly what it needed to. Even when this team doesn’t play at its best, it still just wins, baby. The real tough part of their schedule comes in the back half of the season, but a TURN win should give them plenty of confidence. Speaking of confidence, how about CLTX Gaming? They came into THE TURN on a three-game losing streak and a placement into the bracket of death and turned it into a finals appearance with three tip-top quality wins under their belts. The addition of Speedbrook into the lineup in place of PalmOilPlease was a positive one, as the Canadian averaged close to 14 points per game throughout the tournament. Point guard oFAB was on another level when it came to his playmaking, too. If CLTX Gaming had pulled off the win against Blazer5, he would have been tournament MVP after averaging an insane 19.2 assists per game. He didn’t have prolific scoring numbers every game, but he doesn’t have to when he’s finding his teammates like that. Another positive sign for oFAB was his lessened tendency to shoot the three, a problem that has plagued him as this young season has gone on. At any rate, while this team undoubtedly had its eye on taking home part of that massive steel banner after it got all the way to the finals, this was undoubtedly an important step in reclaiming their spot among the league’s elite teams. With four straight victories spanning back to week three of the regular season, Magic Gaming has surprised just about everyone by becoming a playoff contender with two-thirds of the season to go. Three of those four wins came against Warriors Gaming Squad, Knicks Gaming and Kings Guard Gaming, which makes it safe to say that the Magic are firmly within the middle of the league, and possibly a bit higher if they can carry this momentum further. The biggest detriment to their TURN run (besides having to play against Blazer5, obviously) was some questionable shot selection from KontruL. I’ve mentioned this before and I’ll mention it again here: with such an improved roster since the KingCamRoyalty switch and a better offensive system, KontruL doesn’t have to play as much hero-ball as was required of him when the Magic were struggling. If he cleans that up and is a little smarter with his shots, it will make this team that much better. After missing the past three weeks due to what appeared to be personal issues, Hood made his return to the Cavs Legion GC team at the point guard position instead of small forward, where he had played during THE TIPOFF and week one. The result wasn’t quite as good as what we’ve seen Hood do. Whether it was because of rust after missing so much time (I’m guessing he didn’t practice much during his absence, either) or the position switch threw him off (or both, which is my estimate), Hood managed to put up only seven points and nine assists in the Cavs’ lone game while committing eight turnovers. Not only were the numbers miserable, he didn’t look comfortable running the offense on the 6’3 build all game. It resulted in a blowout loss to Knicks Gaming, a good team for sure, but one that the Cavs probably shouldn’t be losing by 25 points to. I doubt Hood will stick to point guard. It was a worthwhile experiment to try out during one of these tournaments, which are far less important than regular season games. I’d expect to see him back at small forward, where he dominated in the first two weeks of the league, next week against Pistons GT and Mavs Gaming. So there’s a gap in these rankings since there was no review last week, so when I say “Last Week,” I really mean “From Week Three.” A good performance at THE TURN helps some of these teams, but I’m not placing so much stock in this tournament that I’m going to severely punish any underperforming teams. As always, these aren’t entirely based on a team’s win-loss record. Regular season records are listed first while regular season plus TIPOFF and TURN records combined are listed in parentheses. This was the toughest week to rank to date. Well, here we are. This team hasn’t won a game in over a month and has lost to the 15th and 16th placed teams in the official standings during that time. Need wins fast if they want to salvage this season. They’re only moving up because of Pacers Gaming’s situation, but this team still has problems. I wouldn’t mind seeing them stick with Winner Stayz On at point guard as they tried at THE TURN. They finally got a regular season win since my last rankings and looked competitive against Mavs Gaming at the end of their TURN matchup. That is to say, they’re 15th for now but I could see them moving up in the future if they keep playing the way they are right now. So I was pretty high on this team after their win over 76ers GC in week three. With a new coach and a quality win under their belt, I thought they were on the upswing. They’ve had to play Blazer5 twice since then, but an unconvincing 17-point loss to Knicks Gaming has me cooling off a bit. I still like the potential of this squad, but they’ll need at least a couple wins in the next few weeks to convince everyone that they’re a playoff threat. With a new coach (who’s a G-League video coordinator and former G-League assistant coach), I like the new upside of this team. They have games against the Blazer5, 76ers and Mavs between now and the next tournament, though. But a win or two against those teams could be the big turnaround that they need. This team is still squarely in the playoff conversation and it looks like they figured out how they want to play. The next four weeks will be crucial for them. Yes, they had a good run to the semi-finals at THE TURN, but they’ve also taken recent double-digit losses to both of the two teams directly ahead of them in these rankings. I figured before this tournament that they should try out a Blazer5-esque attack with two big men going at it down low and that’s what they did at THE TURN with some good results. Their win against Knicks Gaming in week four was offset by big losses to 76ers Gaming and Magic Gaming. This team is just plain inconsistent and that’s why they sit somewhere in the middle of the league. I will continue to advocate the team hiring a coach for these guys. Yep, Magic Gaming is in the single digits of rankings now. As I mentioned above, this team is in the mid-tier of the league and they are hot. Their 10-point win over Kings Guard at THE TURN is nothing to sneeze at either. Get a win against the Bucks next week and maybe pull out a couple wins against the 76ers, Kings and Jazz before the next tournament and they’ll be playoff contenders. This is such a tough team to predict right now. They’re on a three-game losing streak in the regular season but ripped off a three-game win streak against three elite teams at THE TURN. They play the Bucks, Jazz and Grizz in the next two weeks so this team could be .500 soon. The return of Hood wasn’t quite what we expected, but like I said earlier I don’t think it’s an indicator of his future performance. Lost a close one to Mavs Gaming and dropped their first-round matchup of THE TURN to the CLTX. Could easily be top-five by season’s end. I heavily contemplated putting Jazz Gaming here, but I’m sticking to my word about not putting too much stock into bad TURN performances, especially when they messed around with their lineup a bit. That loss to Wizards District was bad, though, and can’t be overlooked. But their schedule in the next few weeks isn’t too rough and they have the chance to rack up some wins. I’m not sure what the community consensus is on this team, but I’m a big believer in their potential and have been since after THE TIPOFF. An absolute smacking of Pistons GT in week four only made me believe more. Their two regular season losses were both by a single point. Won a thriller against Jazz Gaming in week four but bowed out to the hot CLTX Gaming at THE TURN. They didn’t play JLB during the tournament last week so they weren’t exactly at full strength. Still, they were expecting better from themselves and were one of the favorites to win it all heading into last week. Radiant got his shooting back, and this team got its dominance back. Well, except against CLTX Gaming, of course. But their win over Wizards District is a quality one, and they looked like a top team when they ran away from Kings Guard in the 4th quarter of week four. If you have anyone other than these guys at the top of your rankings, you’re overthinking it. The most confident and consistent team in the league that will still put up numbers on you even if you have a gameplan going in.